The other day I did my Monthly Review a few days early, to finish this month strong and get a jump start on next month. The point of a Monthly Review is to see what your priorities were in the past month, how they may have changed, and how you can be more effective in the coming months. I went through my planner for the past month and evaluated my progress toward my goals. As I looked at each one, I discovered my Priorities were never, ever my tasks toward my Goals. Ever. Why? I realized the things I had written as my Priorities fell in the Urgent And Important category of the Eisenhower Box, and my Goal tasks fell someplace else: the Important But Not Urgent square. For those of you who aren’t familiar with the Eisenhower Box, it’s a great way to assess priorities. Each task is assigned a category: Urgent And Important; Important But Not Urgent; Urgent But Not Important; Not Important And Not Urgent. 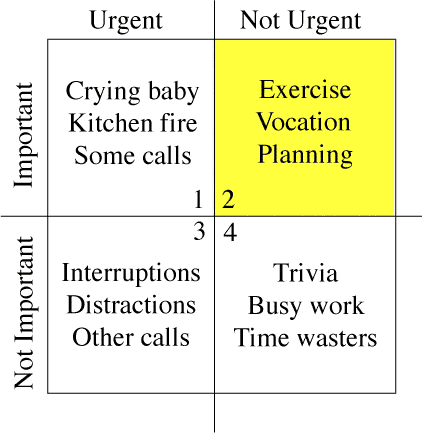 The bottom line is, you want most of your tasks to fall into Category 2: Important But Not Urgent. That way you’re spending your time on the important things, not running around putting out fires (figuratively or literally). The problem is, if a task doesn’t feel Urgent, it’s very easy for it to get edged out. I realized that my Priorities were Important And Urgent: bills due, deadlines, things that would have swift unpleasant consequences if I didn’t do them by a specific time. The Priority box is a great place to put these, to keep them very visible. But why weren’t my Goal tasks considered Priorities? The reason is, of course, Goal tasks are rarely Urgent. They are Important, yes, but many of them don’t have an imminent sense of urgency. I should exercise every day for my long-term health. But if I don’t do it today, there won’t be many consequences (aside from perhaps not being in the best mood). The thing about Goal tasks is they have a long-term cumulative effect if you do them, or not. We don’t want our Goal tasks to get to the point of being Urgent And Important in the sense that, for example, if you don’t exercise every day you run the risk of imminently having a(nother) heart attack. It’s hard to fit Non-Urgent tasks into our days when we have so many Urgent ones to do. Working new goals into our schedule is not always easy, but it is important. The trick is to assign urgency to your Goal tasks so that you can make them a Priority. You definitely have to go for your morning jog/ walk. It’s a Priority, so you organize your morning around it. You need to make more social connections, so prioritize going out to meet new people. The laundry can wait. Assign a deadline, then hold yourself accountable. Remind yourself why your Goal tasks are important, and write these reminders in your planner, on a sticky note on your bathroom mirror, wherever you’ll see them often. Keeping in mind the importance of your tasks will help you make them a Priority. This month, I’m using an orange highlighter to draw attention to my Goal tasks in my planner. This makes them much harder to overlook, and reminds me they are important. This week, look back through the past month in your planner. What were your Goals? And what were your Priorities? What can you do to make yours the same? Goal Setting, Planning Tips, Time Management Eisenhower, time management. permalink. This post totally reframed my approach to how I get through my day. While the things I “must” do (category 1, my bills and deadlines) take priority due to timing and necessity, it’s so important to remember that the things I “want” to do (category 2, my goal tasks) are actually more important than the things I “should” do (category 3, which is where I now stick daily housework routines). Makes me feel much less guilty about putting off dishes and laundry in favor of writing, art, and yoga — the three things which will help me eventually reach my goals if I do them daily. Thanks for helping me clarify my “wants” versus my “shoulds”! Thank you for this post, it made me to rethink my tasks! Thank you! I needed this as I look at my business plan for the next year.